Battles are the HookBitcoin BillionaireSession Design: Auto-Battle or Job system?Is there enough depth outside of the battle? More and more games now are adding modes where players no longer even need to play. Players can simply open up the app, start a round, flip a switch, then put their phone down. The AI will make all their decisions. The AI will have all the fun while the player waits for the virtual reward at the end of the round. At first glance, this is worrying. This turns the game into a Skinner box. Tap the button, wait, get a reward. Where is the fun in that? Instead of making the core battle so boring that auto-mode is necessary, shouldn’t designers seek to add more depth to the battle? Focusing design on in-depth core game mechanics is a losing battle. Focusing on making long-term decisions more interesting is a much better strategy for free to play games. In the RPG Genre, having an interesting battle mechanic provides the hook for the game. This is what draws players in and immerses them in the world. If I have no option of control, then this isn’t really a game. When a player starts a battle, they expect to make choices and see their impact. Having novel mechanics in the battle provides early players with a new experience that they have never had before. As seen above, in Summoner’s War, in the beginning, you have choices for each of your players of where they need to attack. This is engaging at first, but quickly goes stale. This isn’t the focus of the game. Secondly, it really showcases the artwork. Your artwork sets the expectations right from the beginning. A player is only willing to invest in games that feel polished, exciting and professional. Making sure that players experience as much exciting battles in the beginning is important. However, as they play many battles, inevitably the mechanic will get boring. Inevitably the artwork will get repetitive. There are few games in the history of game design that have ever managed to keep a core game mechanic interesting thousands of times repeatedly (ex. Tetris, Chess, Collectable Card Games). Especially in a non-multiplayer context, in a casual game, and even more in a mobile context where the interaction complexity possible is limited. In theory this could be done, but it would be incredibly difficult. So how do you keep the gameplay interesting for the long haul while still allowing for a great initial experience? Bitcoin Billionaire is in a weird genre. I’m not really sure how to label it… It’s part simulation, but mostly an “Endless Progression” style game. Your goal is to try to collect as many Bitcoins as possible by tapping the screen. Initially there is the appeal of just madly tapping on the screen. Each tap gets you 1 Bitcoin. You strum your fingers across your ipad watching your money go up. You’re so good at this! But after about 30 seconds this starts to become a bore (also your fingers are getting tired!). 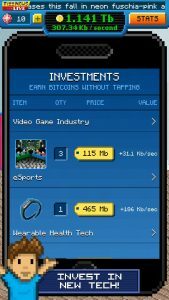 So now the game starts to push you into making investments: earn Bitcoins while you’re not tapping. What this does is ease the player away from a newly-boring core mechanic into something much more interesting: managing investments and optimizing the rate of progression. Bitcoin Billionaire has done an excellent bait and switch: you came for the tapping, but now you are addicted to buying income sources. Cookie Clicker, Make it Rain, Clicker Heroes and Bitcoin Billionaire are four excellent examples of games that have managed to ease a player from a boring core mechanic into something that is much more interesting in the long haul. This transition is exactly what all games need to deliver for successful long term retention. So how do we add this to other genres? Auto-battle is how its been added to the RPG genre. Eventually the game recognizes that making choices in the battle is no longer interesting. The bait and switch becomes making the choices outside the battle more interesting than the battle itself. But Auto-Battle isn’t a trivial system to add. Like all design decisions it comes with benefits and consequences. 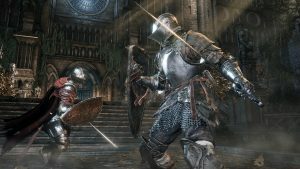 Session Design: Auto-Battle or Job system? 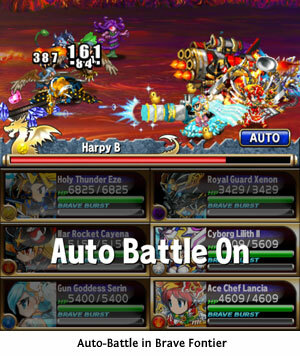 Auto-Battle as a system essentially means that a player will make a choice about which “dungeon” to enter, then leave their phone on and come back to it after a few minutes. 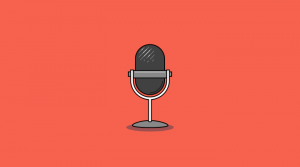 Is this valuable to your session design? Players just opening your app for long periods of time? It will effect your KPIs — your session length will go up. But is that really what you want in the design? Successful games push players to return to the game often throughout the day and focus on meaningful choices. So why demand that they keep the app open during the battle? Job Systems in games have been around for quite awhile. They reached a peak with games like MafiaWars in the early days of Facebook. A player would send their units on Jobs. Tap a button, and the unit would be disabled for a limited time. When the time was up, the rewards for the action were given. This was a nice appointment mechanic that allowed players to opt-in to coming back to the game. If the game was only job systems however, the game grew stale. But what if a Job System replaced the need for auto-battle? What may be more interesting is asking the player to make a choice: Do I send my fighters out without my control for 5 minutes, then return with the loot? Or do I think the AI will mess up this battle, so I should do it manually for the next 10 minutes? This way players can make a choice whether to end their session and come back later, or improve their chances of winning by playing the actual battles manually. Is there enough depth outside of the battle? If the game is really distilled down to a few taps each day this can get boring quickly. Grinding for rewards and items is only fun when there is significant complexity and depth to collecting items. By adding auto-battle in the game, this will put much more stress on your long-term meta mechanics. Do your players have enough interesting decisions outside the battle that will last for months? 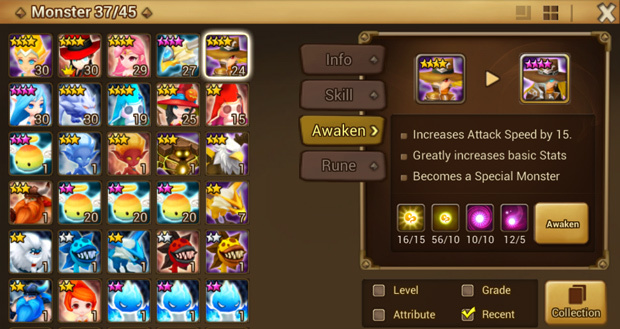 Summoner’s War has Relics to provide interesting decisions in how you upgrade your players. Brave Frontier has the boosting and fusing mechanic which provides years of collection and interesting long-term trade-offs. Many games have a very in-depth loot system which makes for interesting decisions choosing which gear to keep. However, even with a strong loot system with collection, players need an indicator of progress. They need to be immersed in your setting, story and game. Having an auto-mode is great, as long as eventually players will be pushed to an epic boss battle. A battle that surprises them, challenges them, and maybe even progresses the story. This will be necessary wrapper around the grinding that makes it all worth it. These auto-battles end up building anticipation to something new and exciting for the player. In the end auto-battle lets players focus on the choices and decisions that matter to them, no matter what stage of the game they are in. 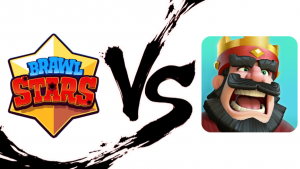 Mobile Free to Play: What about Player Skill?